But sometimes there's a chasm between visualizing that thought-idea-emotion and bringing it to life on paper in a way that captures the moment and compels an emotional response in the people who see it. One thing that bridges that chasm is skill. And the only way to build that bridge is to practice. 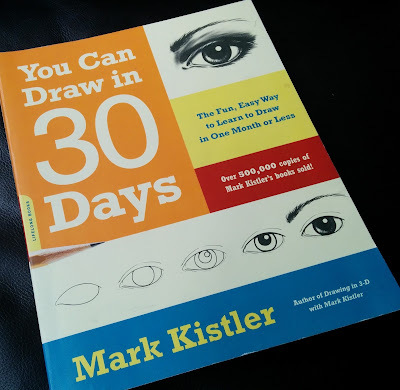 I think the first time I truly understood that drawing was a skill that almost anyone can learn, was when I came across the book You Can Draw in 30 Days by Mark Kistler. Kistler doesn't just tell you it's possible, he shows you through many examples of student work. 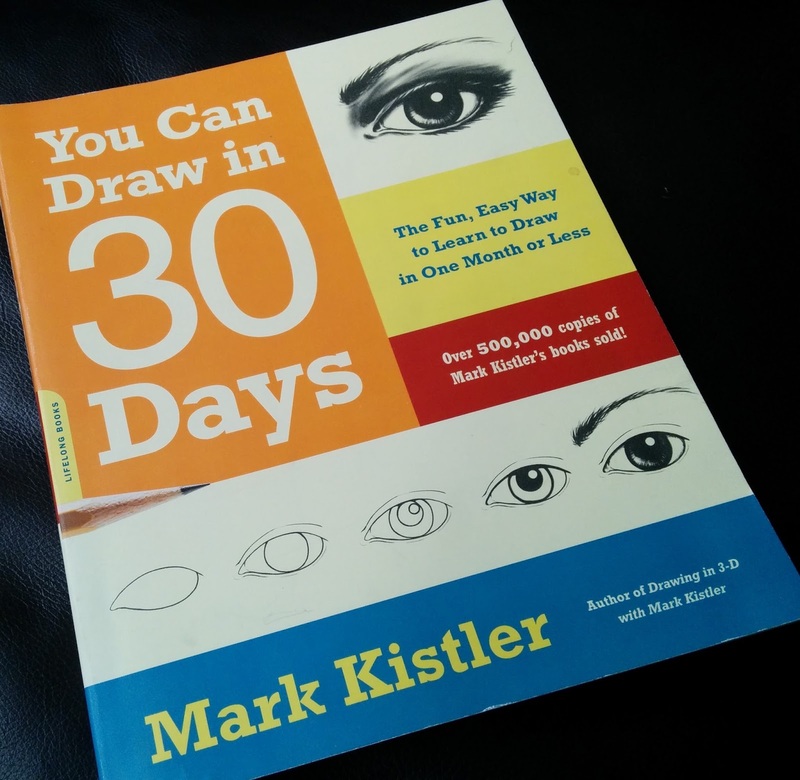 Real people who thought they didn't have "the gift" or "the knack" for drawing discovered for themselves that drawing is a discipline (a branch of knowledge or a field of study), not a talent. I try to carve out time for focused practice every day. Some days that means spending time getting to know my materials better. 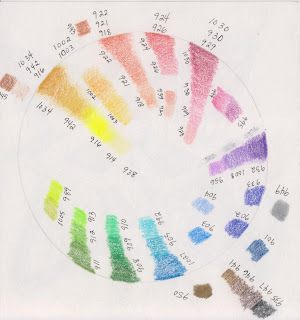 Recently I went through my box of 48 colored pencils and I created swatches of each color to determine how they related to each other. Which could be used together to successfully create shading and highlights? Which could be used together in a gradual progression from light to dark? Where does each fit on the color wheel? They aren't pretty, and they don't need to be. 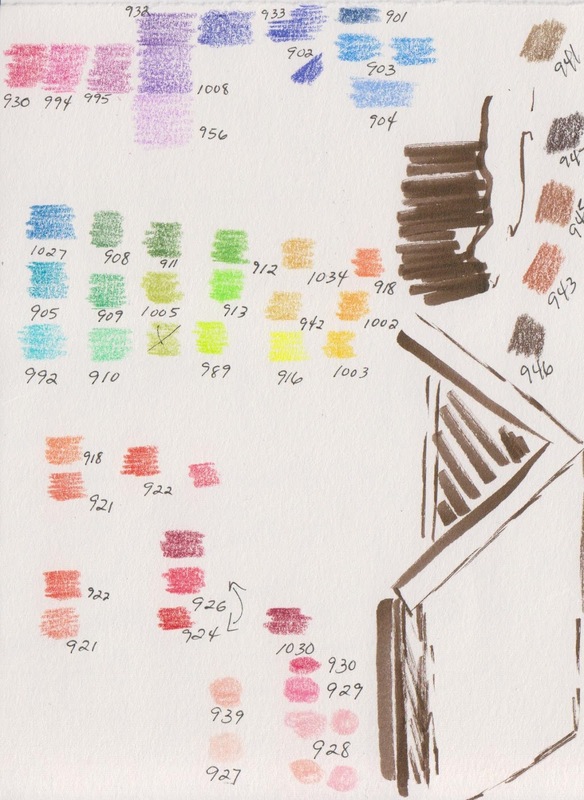 You can even see where I was practicing some strokes with my Pigma Micron brush pen alongside my color swatches. No one but you needs to see your focused practice unless you want them to. Their only job is to help you make progress in your pursuit of improving your skills. Over time, those improvements will show in your work and in your creative confidence. I feel more confident when I reach for my colored pencils now because I spent time getting to know the colors I have available to me and how they will work together. Challenges and prompts are another way to approach focused practice. The constraints of the challenges themselves already create a focus. 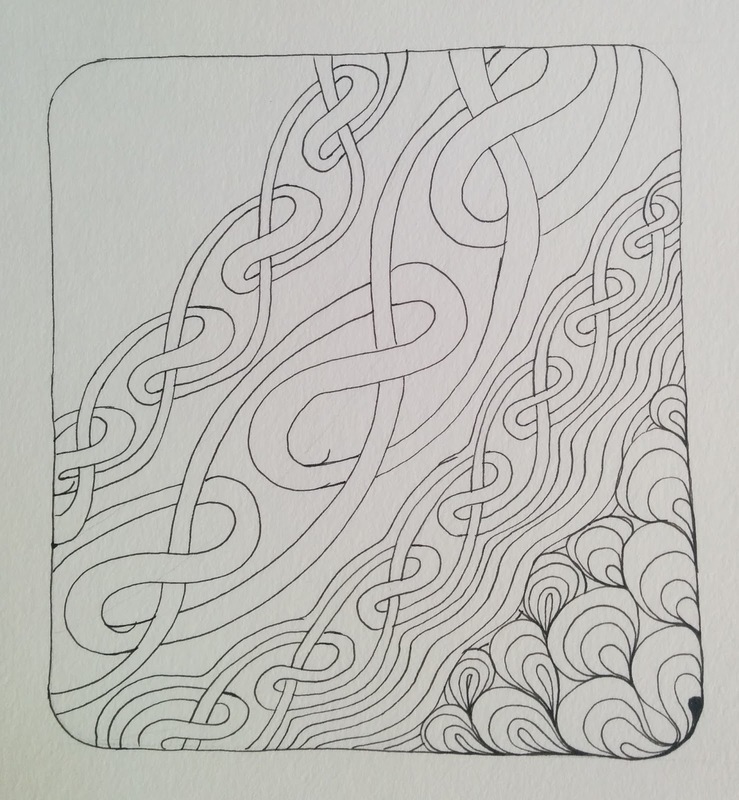 There are many places on the web where you can find weekly prompts for whatever kind of artwork you want to develop, from drawing to photography, journaling to Zentangle®. 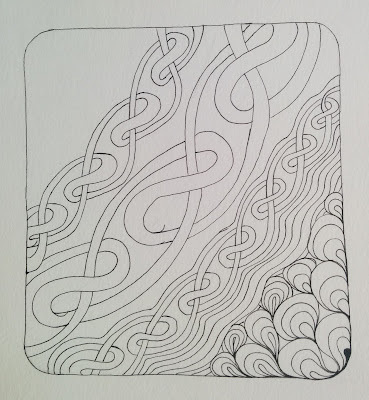 For example, It's a String Thing Challenge #145 prompts us to create a small, square drawing using only the two tangles Skye and Antidots in a diagonally striped composition. These narrow limits invite us to really look more closely at what opportunities are available. How can I create variety when I have only two patterns? How many different ways can I use the composition to my advantage? If everyone has the same constraints, how can I make my tile unique? Lately I've been practicing my shading techniques to take flat, 2D shapes and turn them into dimensional, 3D forms. I've been getting more and more comfortable with the techniques of where to add shading and how to blend the graphite, but there was one technique I'd been avoiding: cast shadows. I saw the intricate pattern for Skye in this weeks challenge and I knew it was time for me to get over my resistance. It was time for me to apply some focused practice . There's no other way to actually improve my skills if I never try it. Here's my line art, before I began shading. Next I added more contrast with ink and graphite and added some shading for dimension. Finally I braved the fearsome unknowns of cast shadows! Don't worry, I managed to emerge the other side unscathed. Are they perfect? Nope. I know just enough about what they should look like to see what I can work on the next time I practice. But I overcame my resistance and I lived to art another day. I reminded myself that it's just a skill, and it's one I am confident I can learn. That's two thumbs up for me. Remember, no one but you needs to see your focused practice unless you want them to. Though I will continue to post mine here for you in hopes that you can get some inspiration for your own growth as artists! 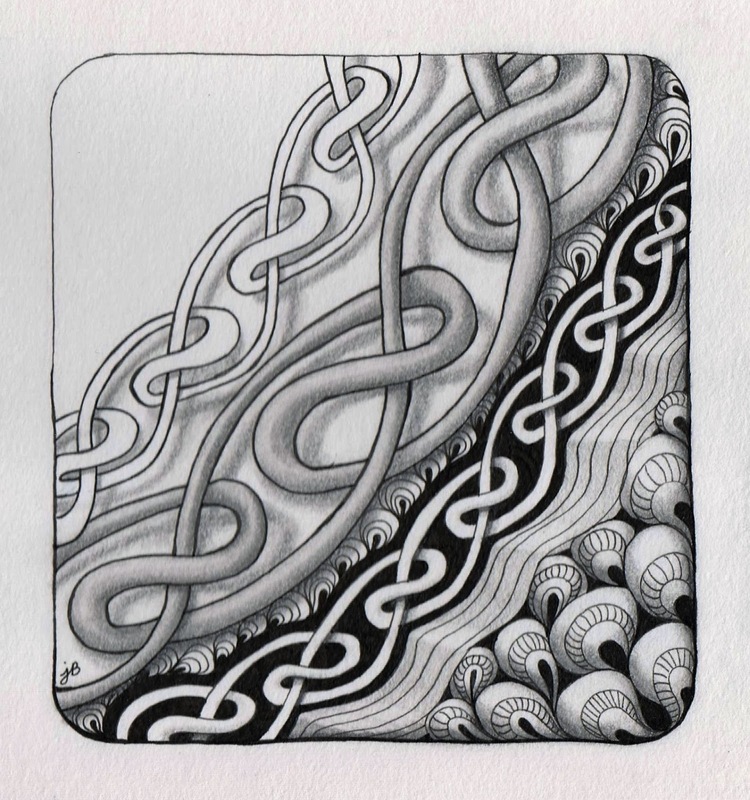 Update 5/31/2016: Just a few days after I posted this tile for It's a String Thing #145, the Diva posted Challenge #270 with an emphasis on the new tangle Skye as well! Skye is a new tangle from Certified Zentangle Teacher (CZT) Margaret Bremner, who is well worth checking out! Yay for bravery! And thank you for the reminder about practice... and practice... and practice some more. Seriously need to check out that book sometime. Very nice challenge tile of Skye and beautiful shadows!!! Nice to show the before and after shading photos. Very nice piece! Thanks! The before and after is a really good learning tool for me. Great shading in your Skye tile! Thanks! It's been really fun diving into shading and seeing where that takes me.